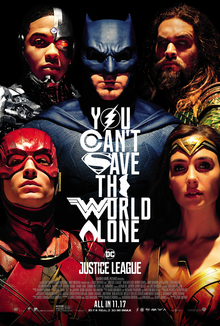 The fifth installment in the DC Extended Universe, based on the DC comics superhero team, which unites Batman, Wonder Woman, Aquaman, The Flash and Cyborg, for the first time on the big screen together (in an attempt for DC to imitate the success of Marvel Cinemas' 'THE AVENGERS'). DC even brought in Joss Whedon (the filmmaker behind the first two 'AVENGERS' movies) to co-write the screenplay, and direct $20 million worth of reshoots. Zack Snyder (who also helmed 'BATMAN V SUPERMAN: DAWN OF JUSTICE', 'MAN OF STEEL', and co-wrote 'WONDER WOMAN') directed and co-wrote the film as well, with Whedon and Chris Terrio (who also co-wrote 'BATMAN V SUPERMAN'). The cast features Ben Affleck, Gal Gadot and Henry Cavill reprising their roles as Batman, Wonder Woman and Superman (from previous movies). Jason Momoa, Ezra Miller and Ray Fisher also costars as Aquaman, The Flash and Cyborg (which they previously performed cameos as, in previous films). Amy Adams, Jeremy Irons, Diane Lane, Connie Nielson and Joe Morton also reprise roles from other movies too; while J.K. Simmons and Ciaran Hinds join the cast. The story deals with the superhero team forming, after the death of Superman, to battle a new supervillain named Steppenwolf, and his army of Parademons. The film has gotten mostly positive reviews from fans so far, and some critics even like it too. I was severely disappointed with the movie, and honestly found it to be mostly a bore (sadly). The story takes place months after the death of Superman (Cavill), and the events of 'BATMAN V SUPERMAN', when an alien army of creatures called Parademons are invading Earth. They're lead by a military officer from Apocalypse, called Steppenwolf (Hinds). Steppenwolf is on a mission to find the three powerful 'Mother Boxes', that are all hidden on Earth. Bruce Wayne (Affleck) teams with Diana Prince (Gadot) to stop the invasion. The super duo seeks out three other gifted superheroes to help them; Aquaman (Momoa), The Flash (Miller) and Cyborg (Fisher). Together they form the superhero team called 'Justice League', for the first time. The movie is really slow-paced at first (and for most of the film actually), and I was bored out of my mind at times. There's a lot of ineffective character development, in my mind, that doesn't really help develop the characters much. The action scenes are all uninvolving, and dull, in my opinion as well. This is coming from a fan who absolutely loved 'WONDER WOMAN' and 'BATMAN V SUPERMAN' ('SUICIDE SQUAD' and 'MAN OF STEEL' too, to a lesser degree), and I have been a bigger fan of the DC Extended Universe lately even (over the MCU). I have to admit this film just doesn't work for me though. That's not to say it's bad, or overly cheesy at all (that's why I'm still giving it 4 out of 5 stars). It just really let me down. I had really high hopes though, and I still do for future DC movies (especially 'WONDER WOMAN' films). Gadot is awesome in this still, even though she's not given enough to do, and she's the scene stealer (like always) definitely. I think she deserves top billing even.